A scenario is a higher-level structure above the sample set, typically corresponding to a geographical area where a large-scale nuclear event occurred and containing all of the sample sets collected by responders in all iterations (see the overall workflow). To create a scenario, click the 'New scenario' menu item under the 'Scenarios' menu. The dialog that pops up allows you to enter a name and some descriptions for the new scenario. You can also choose to put one or more sample sets into this scenario at the same time by selecting them in the bottom-right list showing all existing isolated sample sets. After clicking the 'OK' button, a progress dialog may pop up, and the new scenario containing the selected sample sets will appear under the 'Scenarios' category in the left panel. You can also click the 'Cancel' button to exit this dialog. 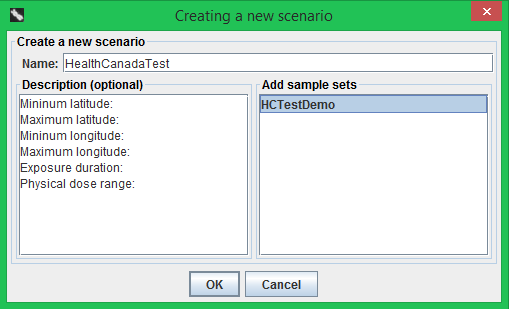 To add an isolated sample set to an existing scenario, first select the scenario in the left tree, then click the 'Add sample set to scenario' menu item under the 'Scenario' menu. In the dialog that pops up, select the sample set(s) that you want to add, then click the 'OK' button. Click the 'Cancel' button to exit the dialog. To remove a scenario, select it in the left tree, then click the 'Remove scenario' menu item under the 'Scenarios' menu. 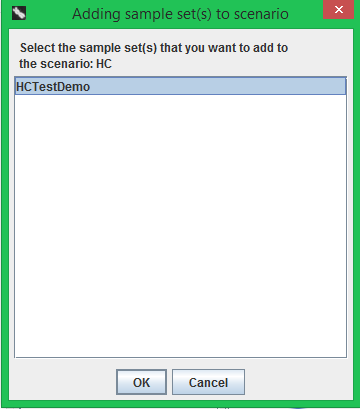 If the scenario contains one or more sample sets, a prompt dialog will appear to inquire whether you also want to delete the contents of the contained sample sets from the server. Answering 'No' will only move the sample sets under the 'Isolated sample sets' category.